Invigorating and tonifying, the Parks Aromatherapy 6 Tot Pomegranate Gift Set combines rich and enlivening pomegranate with the citrus kick of orange, lemon and grapefruit - for a fruity fragrance blend that will awaken all of your senses. Pomegranate is an exotic fruit found in warmer climates, from the Mediterranean Sea to Southeast Asia. Its sweet, fruity aroma is a natural deodoriser, making it a great choice for kitchens, while it's also known to promote calm and tranquillity. Our Aromatherapy Pomegranate luxury scented candle contains the perfectly captured scent of pomegranate, so you can enjoy a true-to-life fragrance blend that will fill your space with a warm and invigorating fresh fruit scent. To this pomegranate heart, we've added a twist of grapefruit, lemon and orange. These refreshing notes of citrus will help to lift and highlight the entire bouquet. 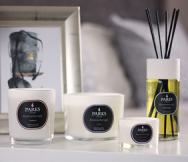 This timeless pomegranate scent is part of the Parks Aromatherapy collection, a range of luxury home scents that successfully combine ingredients renowned for helping to create a sense of calm, tranquillity and well-being. The tonifying and stimulating properties of pomegranate make it one of the most popular scents in the collection, and the perfect choice for those who enjoy invigorating fruit fragrances in the home. Our Pomegranate Candle 6 Tots Gift Set features six tot-sized candles with a combined burn time of approximately 50 hours. This limited-edition gift set will transform your home by filling every room with the lingering fragrance blend of fresh pomegranate and citrus.